Design Thinking is a design methodology that focuses on solutions to solve a problem. It is extremely useful for solving unclear or unknown complex problems, understanding human needs, reframing the problem in a human-centered way, creating many ideas during brainstorming sessions, and taking a hands-on approach in prototyping and testing. Learn about your customer segments through observation and interviews. Create a standpoint based on your stakeholders’ jobs, pains and gains. Validate your solution by interacting with your customer. Come up with creative solutions with brainstorming techniques. Build a mockup of some of your solutions and show to others. Learn about your customer segments through observation and interviews. Get out of the office and talk to your future customers and stakeholders. A Customer Safari in short means leaving the conference room, to go out and witness facts and realities yourself and with your colleagues that are far beyond typical customer data. The Context Map is a framework we use to help you understand the context, to map out the trends with your team, and share different perspectives. It will help you to look for drivers outside your own company and have a conversation about the forces that (could) shape your business now and in the future. The Customer Journey is a tool that helps us get insight into, track, and discuss how a customer experiences a problem you are trying to solve. How does this problem or opportunity show up in their lives? How do they experience it? How do they interact with you? Create a standpoint based on the jobs your stakeholders want to get done, but also their pains and gains. When it comes time to really understand your customers, including their jobs-to-be-done, pains, and gains, as well as your offer to them, the Value Proposition Canvas is one of the best tools available to help you in this regard. The business model canvas is a great tool to help you understand a business model in a straightforward, structured way. 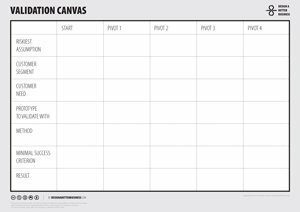 Using this canvas will lead to insights about the customers you serve, what value propositions are offered through what channels, and how your company makes money. Brainstorming has pitfalls such as the “Highest Paid Person’s Opinion”. Numerous techniques can avoid these traps and considerably expand the range of ideas. When you’re finding that everyone’s ideas are falling in and around the same areas of exploration, it’s time to expand the boundaries of your thinking. This is a perfect time to use a creative matrix. The Business Model Canvas is the perfect starting point to explore potential variations, through creative techniques: Epicenters, Follow Patterns, Freshwatching, Remove your core, and more. Build a mockup of some of your solutions and show to others to gain valuable insights. You don’t have to be an artist or a designer to benefit from sketching. Visual thinking can help to trigger and develop ideas that discussion and writing might otherwise leave unturned. Group sketching involves participants building on each other’s ideas. Simply put, prototyping is the art and science of faking it before making it, where ‘it’ refers to an innovative product or service. Prototyping is used to make value propositions tangible and concrete. It helps you test a certain aspect of the product or service you have in mind. When you discover your solution is flawed, you need to adapt: that’s a pivot. Once you’ve found your riskiest assumptions you’ll need a way to figure out how best to test and measure them in a quantitative way. The experiment canvas provides a straightforward way to break down your assumptions into measurable, observable, experiments. With your experiments in place, it’s time to start testing them and tracking the progress over time. Sometimes your tests will return positive, sometimes negative. Along the way you’ll iterate – adding and changing as you go. This tool will help track your progress over time. Take all you have learned and go back to the beginning. Rethink your assumptions, your point of view and improve your solution. What better way to get to know each other? If you are satisfied, you write a testimonial! What is your biggest challenge to move forward and position your company for the long-term? We will come and see you with pleasure. If you are busy, we can setup a conversation on the phone, Skype, Whatsapp, Facetime or Google Hangout.